Flyweights which are balanced by the oil pressure, increase or decrease the pitch and maintain propeller speed constant. An engine-driven unit used for variable-pitch propellers. A CSU automatically permits adjustment of the pitch for varying the speed and power. 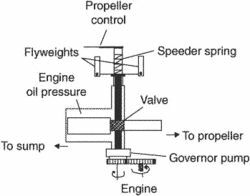 This allows the propeller to operate more efficiently at any selected combination of RPM, manifold absolute pressure, and air speed. In an attempt to do a comparative performance benefit based on similar chiller price, the base efficiency of the constant-speed chiller was improved by 10% by taking the additional dollars spent on a variable-speed drive and applying it to improve the design performance for the constant-speed unit (generally in the form of more effective heat exchangers). Electric motors have high power-to-weight ratios and, when sized properly, can provide sufficient torque over a wide speed range to replace a multi-speed transmission with a simple constant-speed unit. The equipment also requires more room within the station, and may produce more noise than a constant-speed unit.